Manchester United have to strengthen things at the back if they are to have any chance of challenging for the Premier League title next season. I think, the Red Devils need a quality central defender, an experienced right back and a top defensive midfielder in the summer transfer window. As far as the defensive midfield is concerned, reports suggest (The Irish Independent) that Manchester United are seriously interested in signing West Ham’s Declan Rice, who could cost over £50million. At the moment, Nemanja Matic is our first choice holding midfield star. Over the years, the former Benfica man has been solid in front of the back-line but now, he is past his best and mainly inconsistent. The Serbian international will turn 31 in August and at times, he has been too slow in the center of the park. Therefore, he should be replaced and in my view, Rice, who is extremely talented, could serve as a long term replacement. The 20-year-old starlet broke into West Ham’s first team in the 2016-17 campaign and last season he mainly played in the central defense. However, this season, Pellegrini has played Rice in the defensive midfield role and the youngster has excelled big time. 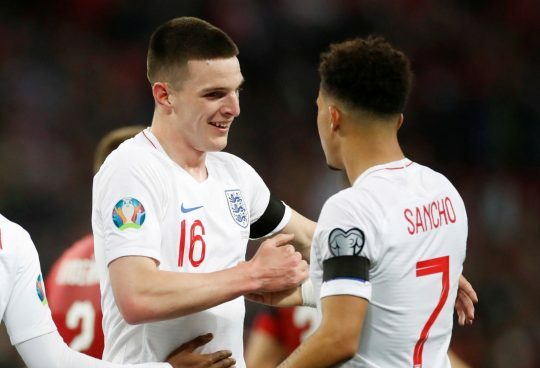 Due to his top performances, Gareth Southgate gave him the chance to make his international debut for England last month and so far, he has made two appearances for the Three Lions. If the former Irish international does end up moving to Old Trafford then he should get straight into our starting XI as the chief play-breaker. Here is how Man Utd could line up with Declan Rice.